Home / About SSGS / Active Ageing! Golf is the perfect game to play throughout one's life. We all know that Tiger Woods started golf at the age of three. And we also know that it is full of silver-haired participants who just can't live without their habitual visit to the fairways! Golf allows participation through one's lifetime. So it's a game for all ages. There in lies the key to active ageing through golf. Without the pressure of competition, socialising is the main priority and often starts even before the game commences. Enjoying the great outdoors with friends, the sun shining in our faces while we work to get the creaks out of our bodies - all this makes life worth living. 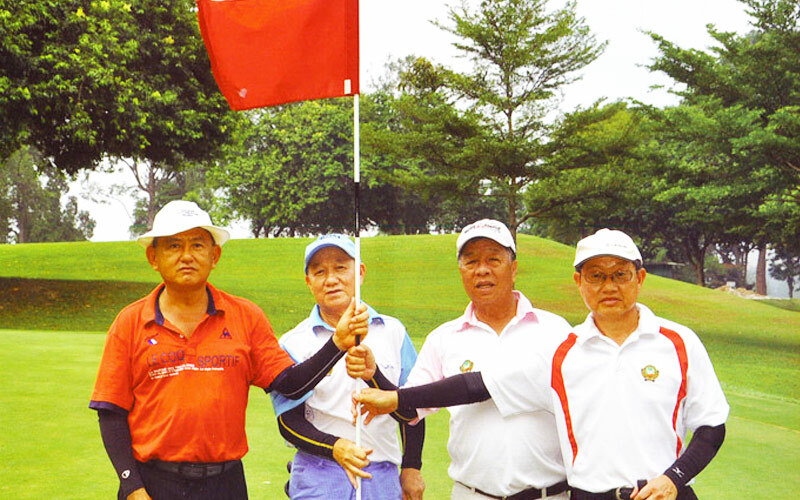 At the Singapore Senior Golfers' Society, the fun doesn't stop at golf. We also organise karaoke and sing-a-long sessions, which are well attended. Our taste buds are not forgotten as we glean from our members intelligence network the location of the best hawker or restaurant food. Our overseas trips are always eagerly anticipated and oversubscribed. Not only are these opportunities to test our golfing skills on foreign soil and different weather conditions. They also bond the members together as they experience new golf courses, see the sights in new lands, meet new friends and enjoy different foods. Oftentimes, with the help of senior golfing groups overseas, we are privy to playing on the most exclusive courses and hosted by local groups to dinners.